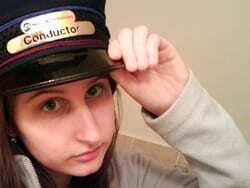 All Aboard For an Excursion to Madison Square Garden, and the National Horse Show! In terms of historic preservation in the city of New York, Pennsylvania Station is a a sore spot for many. It was the gorgeous building that we didn’t save, that we couldn’t save. The Beaux-Arts station was a beautiful monument that was torn down, and for what? To be covered over with an arena. For this, Madison Square Garden has drawn the ire of many railfans and history buffs, but in reality the Garden has a longer history than even the original Pennsylvania Station, and is coincidentally linked to the New York and Harlem Railroad. The ring at the second Madison Square Garden is being readied for the National Horse Show. Originally established in 1879 at East 26th Street and Madison Avenue, the first Madison Square Garden was a roofless arena that sat 10,000 spectators. With the completion of Grand Central Depot in 1871, the New York and Harlem Railroad moved their operations, no longer needing their depot near Madison Avenue. While the land was first used by P.T. Barnum as the “Barnum Hippodrome,” William Kissam Vanderbilt took control of the space two years after his grandfather’s death and renamed it Madison Square Garden. 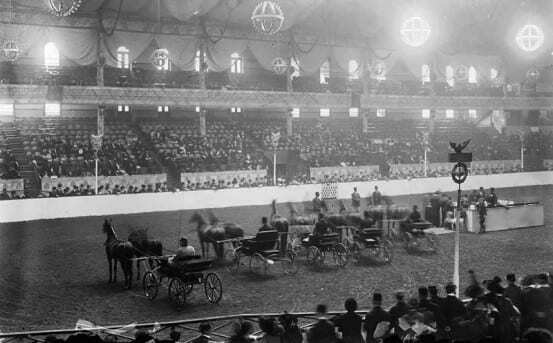 The Garden hosted various sporting events, including the National Horse Show, which would become a yearly tradition at the venue. Parade of winners at the 1896 National Horse Show, held annually at Madison Square Garden. 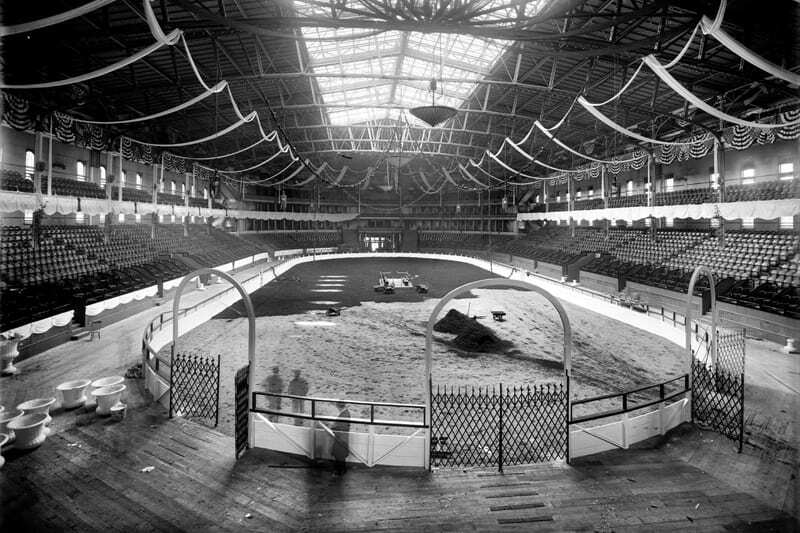 The National Horse Show at Madison Square Garden, 1913. The first Madison Square Garden lasted until 1889, when Vanderbilt sold the property to a group of wealthy investors including J.P. Morgan and Andrew Carnegie. They tore down the first Garden to build the second, designed by prominent architect Stanford White. The second Madison Square Garden opened in 1890 and lasted until 1925. The venue hosted a wide array of events, from boxing matches to plays, circuses, concerts and even the Democratic National Convention. Unlike its predecessor, the second Garden was fully enclosed, allowing events all year long, and in any weather. Judging at the National Horse Show. British officers on their mounts at the 1910 National Horse Show, and horses outside Madison Square Garden. Alfred Vanderbilt, serving as the president of the National Horse Show, first invited the British cavalry to compete in the show in 1909. 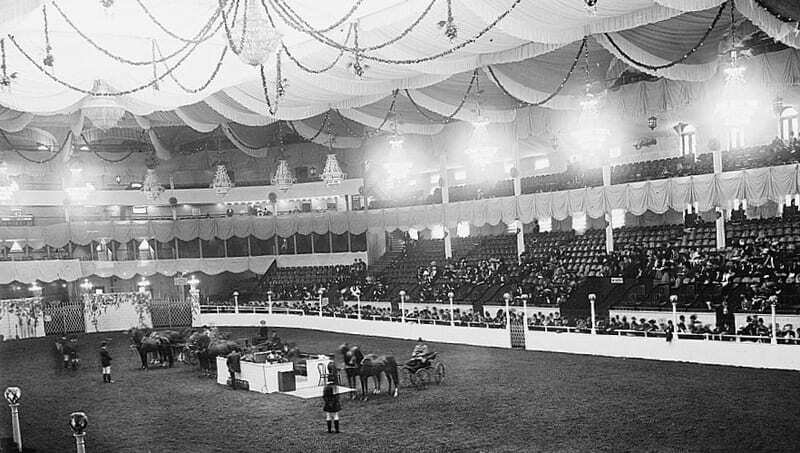 The National Horse Show was one of Madison Square Garden’s major events, and was hosted at all four venues to bear the name, up until 1989. 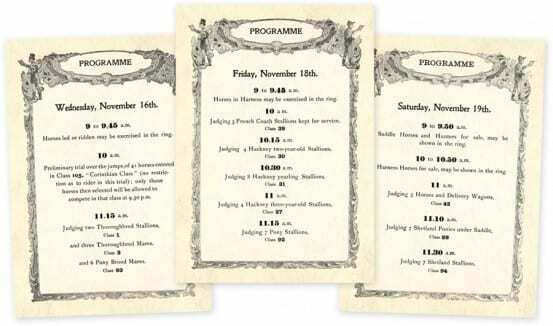 First established in 1883 by a collection of affluent members of society, the show was regularly held in November. While the spectators certainly included the rich and powerful, many regular people came to see the show, and some came by train. 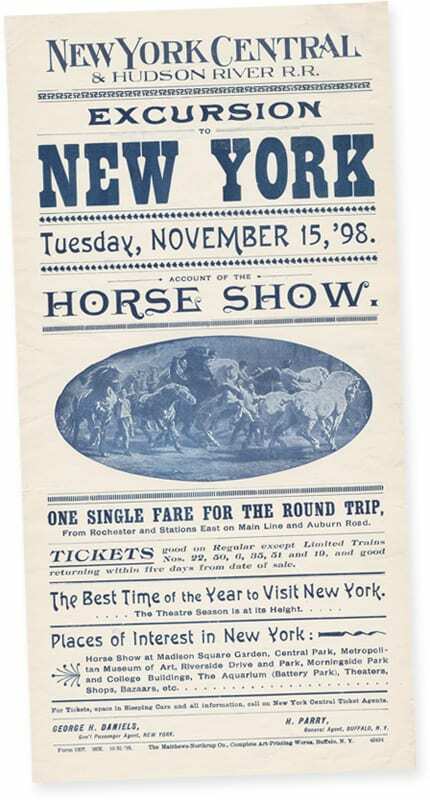 The New York Central offered special excursion tickets for those looking to go to the 1898 show, and printed an attractive brochure advertising it. A New York Central excursion brochure featuring the National Horse Show. The brochure advertises that November is, “the best time of the year to visit New York…” which may strike some today as a bit odd. A warm locale like Florida sounds great for a winter vacation, but in the 1880’s anyone who was anyone headed to New York City. 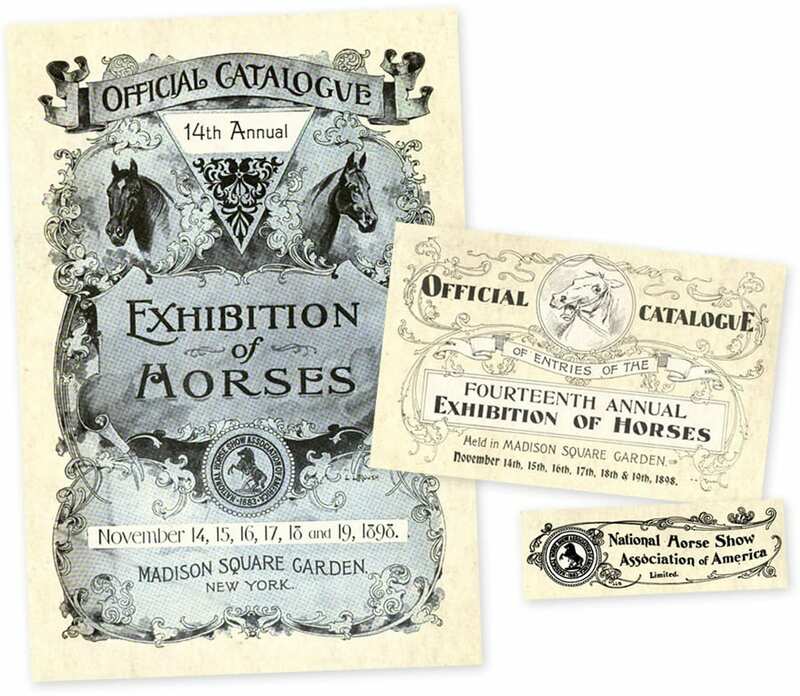 Fitting an event established by the affluent, the National Horse Show became a part of the New York social calendar, just as much as the opening of the opera season, or Mrs. Astor’s annual January ball. By summertime the socialites would move on to Newport, Rhode Island and their “cottages”, before returning to the city in November, and beginning the cycle anew. The second Madison Square Garden was ultimately demolished, and in its place the New York Life Building was constructed. In 1925 the third arena to bear the name was opened, although it was located on Eighth Avenue between 49th, and not near Madison Square. Coincidentally, the place on which the third Garden was constructed was once a storage barn for trolleys. The third Garden lasted until 1968 when the fourth and current Madison Square Garden opened atop what was once the great Pennsylvania Station. As for the National Horse Show, the competition is still held, although it now calls the Kentucky Horse Park home. 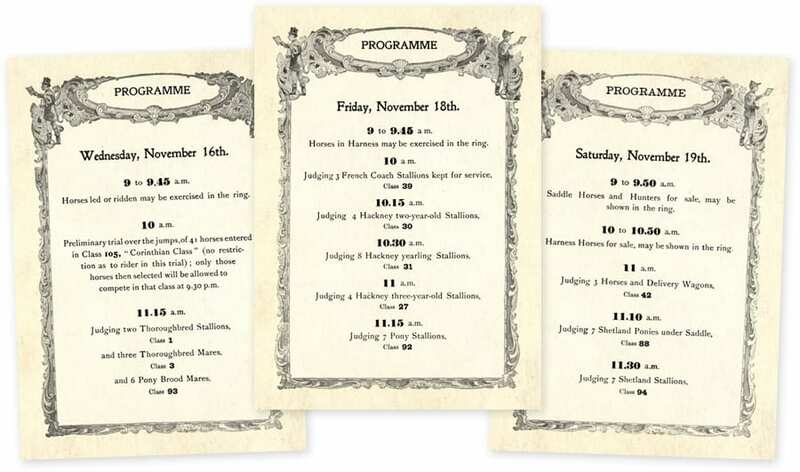 For some added information, the painting depicted on the Excursion flyer is “The Horse Fair” by Rosa Bonheur. The painting was first exhibited in Paris in 1853 and is now at the Metropolitan Museum of Art, a gift to the museum from Cornelius Vanderbilt in 1887. That is pretty awesome! Thanks! The third Madison Square Garden is the one I was most familiar with. Saw many Knicks and Rangers games there between, say, 1955 -1965, as well as circuses, rodeos, and even a six-day bicycle race! I, too, remember going to the third incarnation of MSG to see the circus and the rodeo. I’m surprised that you didn’t mention the second MSG’s greatest claim to infamy: the murder of Stanford White on its rooftop in 1906 by millionaire Harry Kendall Thaw over White’s affair with his wife, actress Evelyn Nesbit. Doesn’t quite match the infamy of the present MSG for its destruction of Penn Station, but it’s a juicy bit of history. Haha, I had heard about his murder, but I didn’t know it actually happened there! The archives of the New York Times for that period of time should be accessible by anyone. It was funny. When they talked about Penn Station during the PBS documentary, someone described its replacement as “really a disgusting rabbit warren.” While I agree that the loss of Penn Station was lamentable, I was struck that they didn’t interview Marv Albert or Sam Rosen or someone else who could’ve said, “It’s not all bad.” When a beloved building is destroyed, the best thing that we can do is to make new memories in the building that replaces it.